One of the images I took for the Lighting II Challenge in May. This was taken inside the abandoned Brickworks factory in Toronto. I very seldom take a shot that includes me but I felt compelled to have a human figure in this shot so I set up the camera on the tripod but forgot to change the settings. I sat there for what I thought was too long a time. The long exposure overexposed the highlights but was able to tone it down to an acceptable degree. Shot in raw mode. I adjusted the white balance for a warm feel and further saturated the yellow. I cloned out the over-exposed areas on my leg leaving just enough to show that the light was directly hitting it. I did some burning here and there. I used Neat Image and sharpened the image after cropping and resizing. wow just came across this, very good!! This is a one of a kind, once in a lifetime photograph. Utterly STUNNING! Oh my gosh this rocks!! Never happended upon this beauty until now. Amazing! Couldn't get anywhere close to voting on all the images in this challenge because of slow dial-up. What I shame I missed voting on this wonderful image. Very nice idea and well executed. way to go Henry! really loved this shot. Wonderful tones and light. Congratulations on 5th (of 829!) Now a new fav of mine! This is a master piece. Wow! Amazing photo Henry! Great job and congrats on 5th! Thanks everyone for all your comments and votes. This is a tough challenge , there are so many talented photographers producing superb work. Congrats in a big way to the ribbon winners. Message edited by author 2006-02-01 09:36:08. Thanks kiwiness for your comment... I didn't use any filter on this shot. What you're seeing is what the camera saw. I see that now, good work! This is very cool! I'd love to see the original. Thanks for your comments. Here's the original shot resized for web. Thanks for your comment. No I didn't create the the light source. Good work, what filter did you use for the light flare? Congratulations on your top five finish with this amazing lovely study. I am so pleased to see this gem do well! No one can go far enough to discourage the LORD from reaching that soul with His eternal light! Great pic, very nice set up on the the composition. The perspective and the colors are wonderful. Great way to convey the mood. How beautiful and thoughtful. Color is marvelous. Thought provoking. Cool location. You had a good eye for the effects of light and shadow here. Maybe you should have moved the camera further too the left, the lines on the ground are not tilted enough to convey dynamism, so having them perfectly perpendicular would have worked better. 10. Sweet shot! The lighting really does it! And tells a story too, hope to see this place well. Wow this is an impact shot. What an emotional shot! Very well done, thanks for the new fav. Wery well captured. I like the soft sunlight making real nice coloring of the room. Love the sunbeam. Very atmospheric, pleasing composition. Lovely colours, wonderful lighting you took advantage of. Where's the hope? Very depressing and desolute. I love it! Great job! love the constrained tones to keep the viewer focused on the main point of the entire image. 9 - may bump later. awesome shot, the lighting is great, and i love the atmosphere. Head and shoulders above all these macro shots of flowers and birds. Gorgeous. The room and it's colors are beautiful, and the ray of light striking your subject is fantastic. Great work and good luck. I really like the warm tones...this image has a really great sense of space...and fantastic light...very nice. Great title...superb lighting...excellent composition...A top pick of mine! A very strong and inspiring capture. The cropping is wonderfully simple and the tones are subdued but powerful enought to take this image to a very high level for this challenge... well done. I really like this shot, nice warm tones, very well done. very cool lighting and scene. I love the visible beam of light. Excellent shot and if I see any comments about hotspots/overexposure I shall be slapping a few faces after the challenge. I love the rich brown color here and the beam of light coming in from the window. Also love the moody feeling. This is a "thinking" picture. Very provocative and well balanced. Nice job. Very impressive image. It's well composed, perfectly lit (I'm still trying to figure out how you managed to get so much warmth & detail in the wood) and the story drew me in. Good luck! Calm but also powerful. You've done a good job! Excellent photograph, you've really created great mood with the tones and lighting. "10" from me, good luck! Nice piece of art - good vision - and some great processing. A competent shot turned into something special. Love the colours and balance of comp. Neat touches in light sparkles too. Up there for a ribbon I bet. Very emotional photo. Lighting works very well. Exceptional job on the lighting in this shot, nicely composed too. Very nice job working with lighting. Good image. a more convincing model would have improved this. but still a good shot. This is very beautifully controlled light & exposure. Technically one of the very fine images in the challenge. I hope it does well. The dark edges really pull you into this image. I love it. Cool. Now is that you with a timer or is that someone else. Very nice job otherwise. My favorite so far. Powerfully dramatic photo. Love the composition and lighting. WOW Terrific work! You definitely have a top 10 contender here. The light is fantastic, as is the location for the image ... drab and closed off and brown, what a contrast to the one lightbeam. Guy's position is great, too, as is the taken down board still leaning against the window. One to be proud of! very cool. great volumetric light that leads your eye to the model. Bob realized this was not the best of investment properties after all. An image that tells a story, my favorites. He has a look of despair and sense of loss. You almost want to comfort him and ask him whats wrong and if there is anything you can do. Too neat and the set up is awsome!!!! 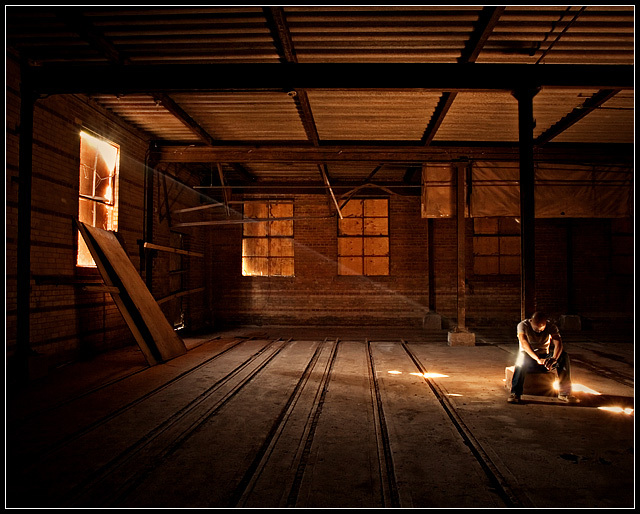 Wonderful use of lighting to evoke a mood. That shaft of light from window to person is great. Like the obvious lines on both floor and ceiling - they give a real sense of perspective/ depth. Like too the textures of wood and brick and metal. The warm tones are great too. This is a really intriguing and well exectured image that makes me look and look. Nice composition and lighting. I am getting a slight right slant of the picture that I would have corrected. It is that single beam of light shining through the broken window that adds soooo much to the scene and mood of the shot. Well done. The scene in this 'warehouse' is bare and thus the single figure sitting all alone hunched over in this great big empty space speaks of isolation & a feeling of helplessness. But as the title and that single ray of light falling on the individual speaks that even then, a glimmer of hope exists. I really like your shot...i haven't seen them all but...i am crossing my fingers for you! Beautifully done.... one of the better shots in this challenge... Good Luck! Proudly hosted by Sargasso Networks. Current Server Time: 04/20/2019 02:13:33 AM EDT.